We created land fragmentation datasets in 1991 and 2000 for forests, urban areas, and wetlands according to the corresponding land cover maps (Kennaway and Helmer, 2007). Spatial resolution: 3 km; Temporal periods: 1991 and 2000.
wetland edge-to-area ratio (right, EDGE_AREA, m m-2). We parameteraized and validated the Soil Water Assessment Tool (SWAT) for major watersheds feeding the coastal wetlands. 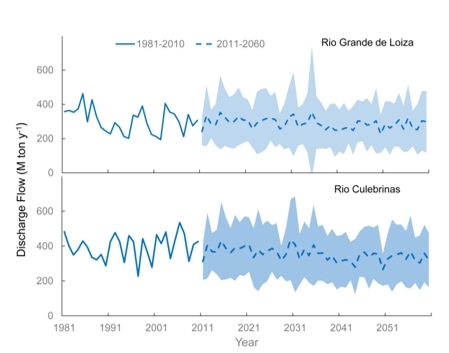 According to the downscaled GCM outputs for the next 50 years, we simulated the water discharges from the watersheds of Rio Grande de Loiza and Rio Culebrinas in 2011 - 2060. We simulated the coastal wetlands migration under sea level rise scenarios using the Sea Level Affecting Marshes Model (SLAMM). The input DEM is at the spatial resolution of 5 m created from Lidar data accessible at Digital Coast website. The wetland distribution is according to the National Wetland Inventory and the wetlands classification was modified to fit that in SLAMM manual. 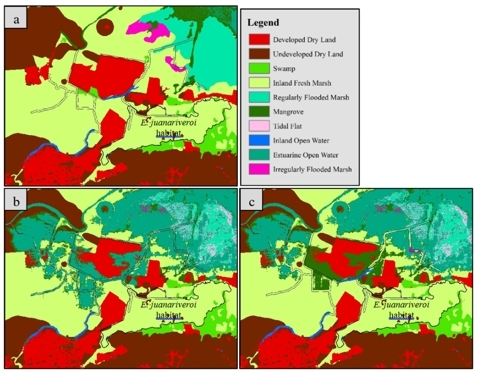 The developed areas were delineated according to the aerial photos taken in 2010 at the spatial resolution of 0.4 m. The wetland migration maps are at the spatial resolution of 5 m.
Land use legacy of wetland drainage for agriculture exacerbates impacts of sea level rise on coastal wetlands. (a) initial status; (b) wetlands migration in 2100; and (c) wetlands migration in 2100 when drainage canals are filled. Consistent mapping of tropical forest change is essential for Global Climate and Land Surface Modeling, but is highly restricted by persistent cloud cover. 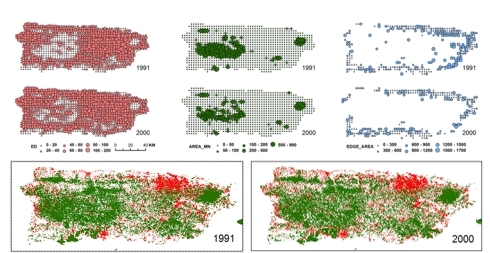 To detect recent forest changes in Puerto Rico, we fused the Landsat TM images in 2009 - 2011 and ALOS PALSAR images in 2010 using the Google Earth Engine platform and the random forest classifier for land cover classification. The land cover map is at the spatial resolution of 30 m.
Wang, C., Yu, M., and Gao, Q. 2016. Fusing Landsat TM and PALSAR images to detect forest transitions in the tropics. Manuscript. Land Cover Map of Puerto Rico in 2010, derived from Landsat and SAR images.